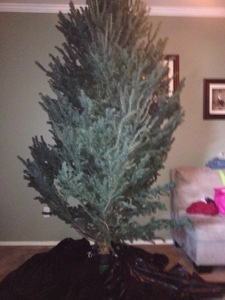 This is what our tree looked like when we first got it. We were really worried that It wasn’t going to open up, but it finally did after about 4 days. It was big! 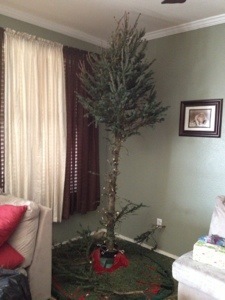 It took up the entire corner, we had to turn it a bit because some of the limbs did not fall! 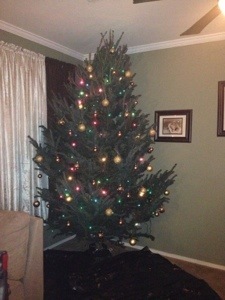 We watered the tree! Honestly we did!! 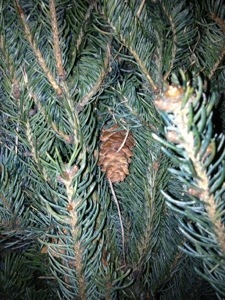 And I loved that it had some little baby pine cones on it, it just made it show that each of us are planned. And even though we are all so different we are each beautiful in our own way ! The kids were given WAY to many gifts. 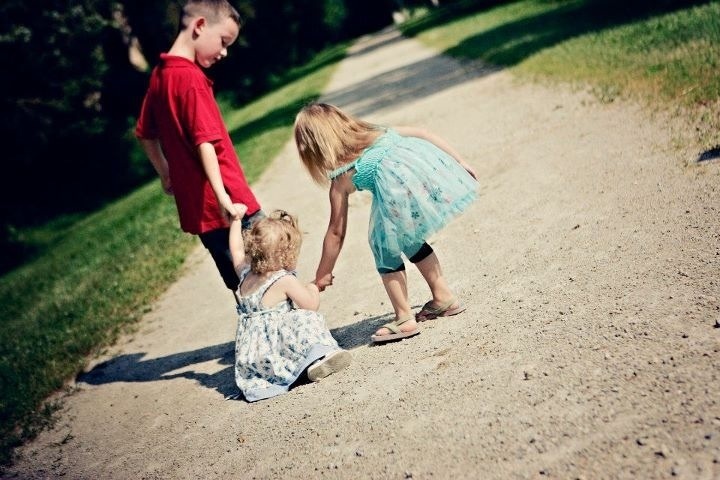 They have been so thankful for all the things that they were given. 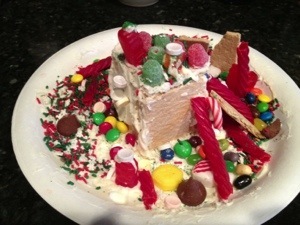 We’ve tried really hard to tell them the meaning of Christmas. Jaden was trying at one point to explain more to the girls “it’s not about how much you’re going to get. It’s Jesus birthday and he’s letting us get his gifts.” I thought it was kinda cute! Have you ever seen your Christmas tree Rain? Ours not only rained once, but constantly. As we would watch TV in the evenings it would sound just as it would when it would drizzle rain outside your window. At first we did not know what it was. And then we figured it out. Our trained surprised us with a Christmas Tree Rain. 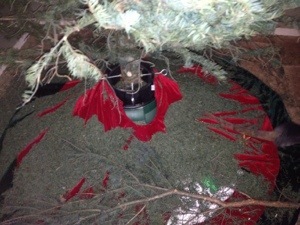 Even though we gave it more than enough water, the tree was so dry that it had no choice but to rain out it pine needles. 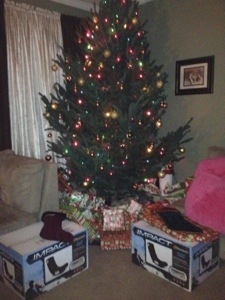 This is what we had when all the gifts were removed from under the tree. 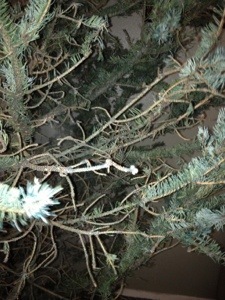 So upon trying to figure the cleanest way to remove the tree from the house without getting the needles ALL the way through on the floor, Sean decided that he would trim up the tree! 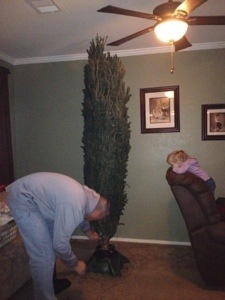 And this is how he towed the tree out. I also give you a little close up picture of the limbs so you could see exactly how much she shedded. Poor tree she barely had anything left. And I’m lucky enough to have a husband that has garage tools! 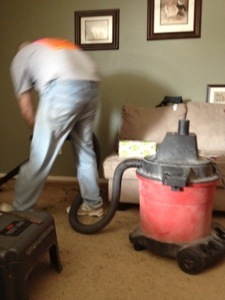 He went to the garage to get our handy-dandy shop vac. I refused to use my sweeper to clean that mess up, I was not going to burn up my Dyson on that baby! So it took awhile but all the needles came out of the floor so it was safe for my Dyson again! I hope that you all had a memorable Christmas. 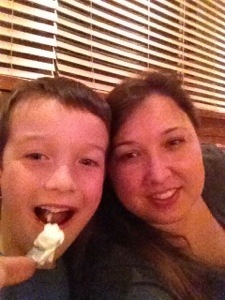 We enjoyed every moment of ours, and look forward to many more memories in future years with our kids! I hope you enjoyed the events of our Rain too!! Long or short and dark and light! So what do you think? long or short? medium brown or highlights? 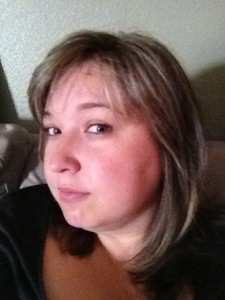 It’s hair it will grow back and I can always color it!! I have to say after looking at the pictures on here, I probably should have taken the time to put some makeup on before taking new haircut pictures!! 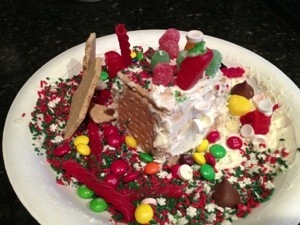 A couple of days before Jaden’s 8th Birthday, his class did a Ginger House Project. I was lucky enough to go spend the afternoon helping them out. It was such great fun for all of us. I have never done this before, so it was a learning experience for me too! I loved that all of the kids in the class remembered who I was from the last field trip, and also that they all wanted my help, it made it very fun for me! This year because 2 of the kids birthdays fell the wk of Thanksgiving, we were able to have MIL and SIL and the fiance here for the first time (they’ve never been with the kids for their birthdays). And our first Thanksgiving with them also. Remember we have been married for 18 years! Little note as I’ve talked about visitors sleeping arrangements in my house. Without even asking about the rules, everyone slept separately… how nice was that!!! 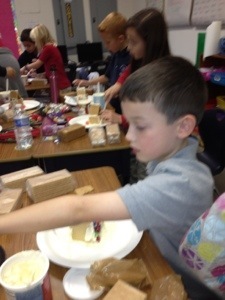 On Jaden’s birthday his class had a field trip. 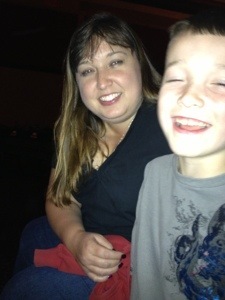 I was able to be a chaperone. I was so excited that I was asked to spend the day with Jaden during this event and on his birthday! After the trip my husband met up with us at the school and we were able to surprise the kids with cupcakes! They were all extra thrilled to celebrate with Jaden his wonderful 8th birthday. 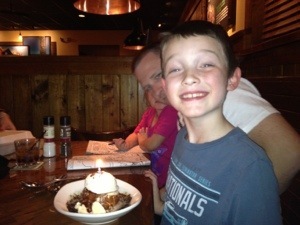 We try to let the kids pick where they want to go for dinner for their birthdays, and our little man picked… Outback Steakhouse . I’m not going to complain I love that place. The Filet is my choice, not that I’m picky or anything! They even served him with a birthday desert! 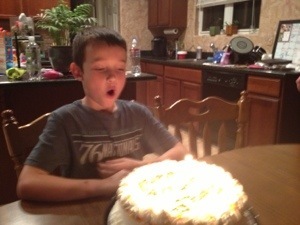 He was so excited and feeling like a big boy! 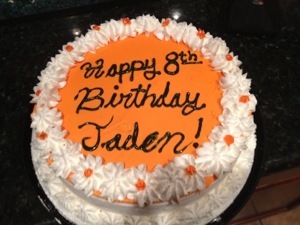 And since I didn’t mention the cake…. that’s because I’m not saying where it came from… remember the post about the store sign over the door… yep this is the cake that I got from that place! They were out of all cakes that day and only had things for Thanksgiving so they tried to doctor it up to make it a little more boyish for me… it tasted good… just their emergency escape needs a little work!!! !